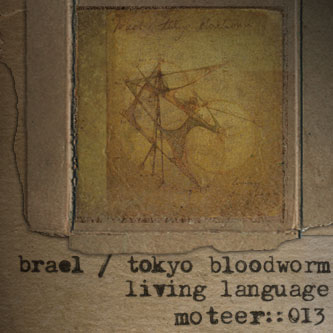 Following on from last week's digital sampler, the Moteer label deliver this gorgeous album from new signings Brael/Tokyo Bloodworm who combine intricate sound treatments with elements of dense, reduced shoegaze, lilting pop and breathless drones with an exquisite attention to detail. The scene is set perfectly on opening track "Saturn Shine", slowly coming to life with diffuse vocal whispers layered in a manner reminiscent of Grouper's fabulous "Way Their Crept" album, before distilled, shimmering glockenspiel and vibraphone make your spine tingle. Stephanie Flood's vocals finally emerge from this velvet arrangement with a subdued, almost downcast undercurrent that provides the track with depth and dimension, bringing to mind bands like The Cranes or Slowdive merged with the other-worldly bliss of Japanese home listening from the likes of Piana or Gutevolk. It's immeasurably moving, beautiful music. "Golden Mean Rectangle", meanwhile, introduces an acoustic guitar to the equation, with a swirl of instruments and found sounds coming across like something off the recent Philip Jeck album strummed along to under a tree in the middle of the desert - intimate and somehow disjointed music evocative of youth and long, slowly unfolding summers. 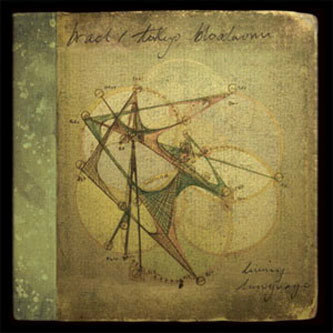 One of album's loveliest moments, however, comes with "Seed" - a fractured love song taken straight out of the Remote Viewer school of thought, revolving around melodies frayed and caressed by miniature processes and aural degradation, the barely audible hum of machines offering an indefinable backdrop for cascading keys and a stream of words half spoken, half sung. Brael / Tokyo Bloodworm have provided Moteer with the most sumptuous and fragile 40 minutes in their catalogue to date - and another debut we absolutely implore you to discover. ESSENTIAL PURCHASE.